A petition created by members of AU’s Panhellenic Council seeking to change the dates of sorority recruitment so it will not conflict with the 2019 Women’s March on Jan. 19 has received over 1,900 signatures since it was posted late last week. On Oct. 26, the long awaited remake of a decades old TV show, “The Chilling Adventures of Sabrina,” was released on Netflix. In trailers and teasers, it promised to be dark and compelling, a subversion from the original “Sabrina the Teenage Witch.” I watched the whole series in an embarrassingly short time span and enjoyed it, but there was something nagging that pulled at me. The show had an immensely diverse cast, one that goes beyond a lot of modern shows today, but failed to deliver on the genuine heart of representation. Politics are omnipresent at AU. The University’s location, the active student body, The Princeton Review’s ranking and a variety of other factors support the conclusion that separating politics from an AU education is impossible. This unique experience of learning in Washington is only enhanced by our affinity for politics. 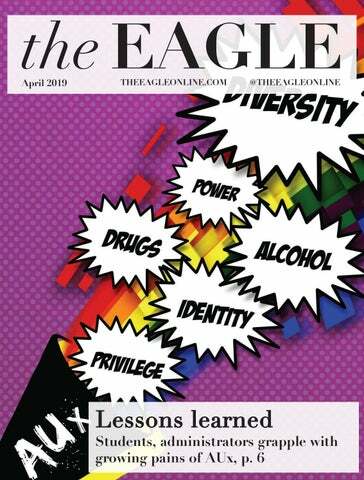 The struggles faced by former AU student Max Durbin, who could not afford to attend the University after he was cut off from his parents for coming out as transgender, raised a central response from readers: What could the University be doing to help students who run into these types of financial challenges? After the introduction of the Student Government referendum to raise the student activity fee from $88.50 to $100 per semester for each student, one question immediately came to mind: Why the hell does this University need more of our money just to adequately fund the programs they offer on campus? Last fall, construction began to replace outdated steam pipes with energy-saving Low Temperature Hot Water (LTHW) piping system. Each campus building will need to be connected to the new system, a move that will AU’s carbon emissions. The scope of the project was described as “massive” by David Dower, AU’s assistant vice president for project management. His journey began in Kaduna, Nigeria. Yilret Yiljep – known by his teammates and friends as “YY” – played for the Nigerian U-16 national basketball team. He then moved to West Chester, Pennsylvania to play in high school and was recruited by AU during his senior year.